Gentleness is a fruit of The Spirit that this world desperately needs. With the actions we continually see, it’s clear that we as human beings need to grow in gentleness. Gentleness isn’t just about physical actions but it’s equally in what and how communicate. We see the lack of gentleness each time someone takes to their phone or computer keyboard to have a "discussion" which turns into a destructive mess because they say and such a way that it's clear the aim is to shred their "opponents" if possible. They obviously don't care about the receiver of that "shredding" as they just want to force their viewpoint...which isn't gentle. I also observe that many times these same people who hide behind their keyboards never act that way in person and rarely say and act that way when confronted with a real person face-to-face. 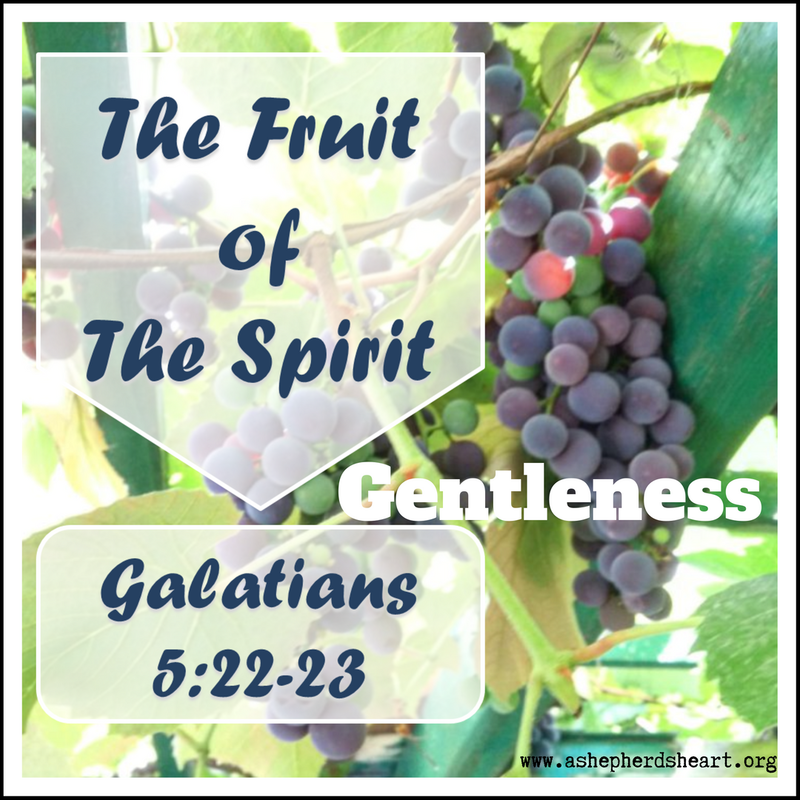 We see a lack of gentleness in how we respond to one another in many other ways as well so we know gentleness is a fruit that many more of us need The Holy Spirit's help to bear! As follower's of Christ, we need to remember that there's a direct correlation to the fruit we bear and our conduct as our conduct is the evidence of the fruit we bear. Our Father in Heaven wants us to be like more like Him through being more Christ like! We are called to be more Christ like and the Holy Spirit is at work in us to be more like Him and part of this is through the fruit of the Spirit. We're challenges in Ephesians 4:14-16 that we're to do our part in the body of Christ and operating in gentleness is a part of it. There’s a spiritual and practical maturity that this passage describes here that He wants you and I to possess. The Fruit of the Spirit is a mechanism by which He accomplishes these things in our lives. The Greek Word 'prautés' is translated in Galatians 5 as mildness, gentleness, gentle strength. Baker's Evangelical Dictionary of Biblical Theology – Gentleness: Sensitivity of disposition and kindness of behavior founded on strength and prompted by love. What is the opposite of Gentleness? From my perspective, things such as anger, wrath, revenge, pride, arrogance, roughness, rudeness, violence, harshness and much more are the opposites of gentleness. Gentleness is an attitude of the mind and heart. Gentleness puts God & Others First. Gentleness allows us to be more caring toward others. Gentleness is shown through our response toward others. Gentleness is also shown through being humble – humility. Gentleness and humility are closely connected in God’s Word. Gentleness in some translations of the Bible is translated as meekness but with either translation it doesn’t translate to and does not equate to weakness; rather, it’s showing great strength through showing restraint and as you read the Gospels – you see Jesus show great restraint at times and great power at times. In Matthew 11:29 Jesus makes a connection for us between Gentleness and Humility and He’s an example of this throughout His earthly ministry. He possessed power beyond measure yet He said learn from Him as He’s Gentle. So, look to Him as your example in all things. Immeasurable strength and power and yet displays gentleness toward us. In John 13:4-17 Jesus washes the disciples’ feet in an act of gentleness and humility. In this act we see the gentleness and others focused nature that Christ modeled for us. He humbly washed the feet of the disciples. He was is the King and yet He served others. He knew at that time that Judas had betrayed Him and yet, He washed His feet. We also see it in John 4 when He spoke to the Woman at the well. Or John 8:1-11 when He spoke to the woman caught in adultery. To clarify, I don’t want to you think that I’m painting Jesus like some do as a pacific or wimpy, rather, He was far from that. There were times when Jesus was very assertive because He needed to speak directly to people and did so in a very blunt way and He has power and authority to do so but this doesn’t negate His amazing example of Gentleness for us. You need to understand that there’s a connection between your words and actions with Gentleness. IF we’re honest, we’re not always the most patient or gentle people. We sometimes are short or impatient with our responses. We’re sometimes angry and spiteful. We’re sometimes impolite. Its something that we all need to get better in! Read: Proverbs 15:1, Philippians 4:5, Ephesians 4:1-2, 2 Timothy 2:24-25, Isaiah 55:9, Matthew 18:15-20, and John 3:30. You need to understand that your words and our actions are influential. You can impact others negatively or positively. Your words can speak life or death to the hearer. You can help or hurt by what you do and say. You need to be as even keeled as possible and seek to be at peace with others. In your career and life overall, this is important! A worthy walk is the goal or should be because we point people directly back to the One Who saved us. How we conduct ourselves, such as Paul described matters, why because the people around you matter! Gentleness is a part of that walk. Have you ever had a quarrel or disagreement with your family, friend or co-worker? Or, Do you find that you tend to instigate quarrels because you have to be right or assume the worst? Or do you find yourself impatient with your parents when they give you instruction, correction or an assignment for a given topic? Or do you find your tenancy is to assume the worst with your parents or siblings? Do I seek to teach others and am I teachable? Is my life a reflection of a worthy calling? Do I conduct myself with humility and gentleness? Gentleness recognizes that His ways are higher than your ways. Instead of the arrogance like we often see that “I got it all together” attitude, there’s a recognition that God is in control. You don’t have to have all of the answers. But He Does!..And no...none of us have it all together! When we correct others: Do it in Gentleness like we see in Matthew 18 as it’s God’s prescription for addressing and correcting sin with hopes that person will repent and be restored. It’s meant to be a gentle and loving process not a harsh and unloving one. It has peoples best in mind. Gentleness must also recognize that Jesus must increase and we must decrease. Life is not about arrogance or ego…it’s all about Him. Ask the Holy Spirit for help in growing in Gentleness. Prayer is vital! Abide in God's Word. As you fill up your heart, mind, and soul with God's Word, you will grow to know Him more and in turn, you'll be able to live out the wisdom and knowledge of His Word in very practical ways day-by-day! You also have to choose and and strive to be gentle as much as possible. If you allow the Holy Spirit to lead you, you will over time become filled with Gentleness and the other fruit of the Spirit. When you think of Gentleness, you can think of Jesus, the Creator of the Heavens and the earth, who showed great strength, humility and restraint when He washed the feet of the disciples and took the cross for you and. As you live the life God has blessed you with, always remember how you can and do impact others whether in a good or negative way. For example, the next time someone says something harsh to you or that you don’t like, consider answering gently…or consider if you need to answer at all. Consider the attitudes, words and actions of the past, and then…Consider what you might need to adjust in your life so you can represent Christ and relate to others better as you seek to operation in the Fruit of The Spirit. Lastly, let's pray for one another that God will help us continue to grow in The Fruit of The Spirit of Gentleness and that we'll strive to be gentle in what we do for His Kingdom and Glory. P.S. I could really use your ongoing help through prayer and other support. Please visit https://www.ashepherdsheart.org/p/help-a.html to find out how you can help me in moving A Shepherd's Heart forward.